When I do genealogical research, I use a spreadsheet to keep track of my progress because I work sporadically and need a way to quickly see where I left off. The free template on this page is an example of how I keep track of ancestors and their descendants. It lets me add notes and comments, add links to ancestry.com, record the ID from familysearch, and create a simple timeline. 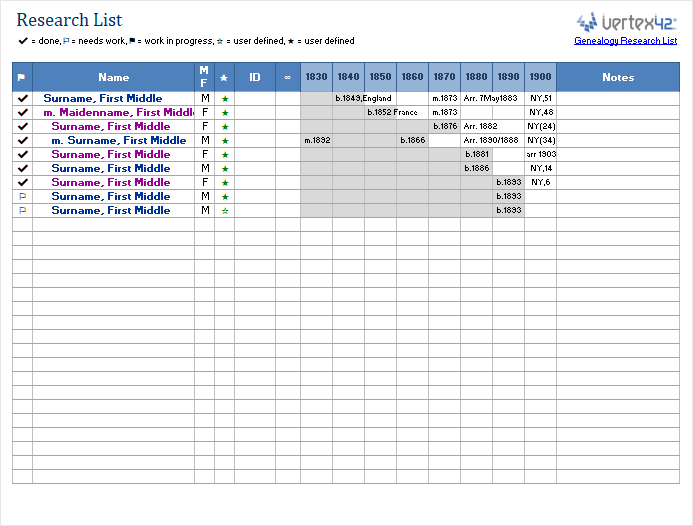 This simple spreadsheet provides a convenient way to organize your family history research. You can record basic information about individuals and make a simple timeline, but the primary purpose is to keep track of which individuals you are working on. I am an avid user of both ancestry.com and familysearch.org, and I save the majority of my work and notes using ancestry.com. 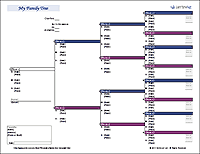 I use spreadsheets to help me keep track of different family lines, because as my family tree grows I need a way to keep track of what I've done, especially if it's been a while since I worked on a particular line. Using a spreadsheet in Excel or Google Sheets allows me to add notes and comments and keep track of whatever information I feel like adding to the spreadsheet. 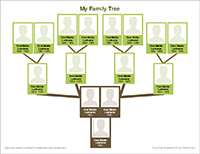 I use the link column (the one next to the ID column) to create a link that will take me directly to the person's profile in my family tree on ancestry.com. I use the ID column to list the FamilySearch ID and I create a link to that profile as well. To create or edit a link in both Excel and Google Sheets you can select the cell and press Ctrl+k, then paste the url. The columns labeled 1800-1950 can provide a simple way to show when and where relatives lived. For example, when I find a person in the 1870 census, I might make a note of "NY,51" indicating I found them in the New York census at age 51. To add more information as pop-up notes in Excel, right-click on a cell and select Insert Comment. The equivalent thing in Google Sheets is to right-click on a cell and select Insert Note. There is nothing very special or complicated about this spreadsheet. If you don't need a column, you can hide it or delete it by right-clicking on the column letter. Family Search at familysearch.org - The largest collection of original source material available free.